Yogita Lapya Jadhav, like every other girl in Ashte village, was pressured to leave school after completing 8th grade. Yogita belongs to the Kokanas – a tribal group found on the border of Maharashtra and Gujarat states in western India. At 17, all of her friends were getting married off and moving in with their husband’s family in neighboring villages. Yogita stood alone and refused to do the same, knowing she’d be forced to bear children immediately, lose her independence as her in laws would control her, and bear many additional domestic responsibilities. Everyone laughed at her. The thought of a woman, especially one her age, without advanced education, affording her own house in Ashte was unheard of and ridiculous. She became the subject of many jokes and village gossip. But Yogita was undeterred. She found a job going from house to house in the village, assisting women with their cooking. It was the same job her father had been doing – for nearly 30 years. She managed to bring in around $2 a day, but this wasn’t nearly enough to buy a house. After all, her father was still paying off debt he owed on their family home. Yogita resented being bossed around by the women of the village. She dreamt of running her own business. So, a year into her cooking job, she quit. She had saved 7000 Indian rupees (around $104). With her savings she bought a used, foot-operated sewing machine. Each morning she walked around her village, hawking her sewing services from house to house. Each evening she sat in her family home, hunched over her machine, stitching women’s blouses. In 2012, Yogita did something no other woman in her village has ever done: she took on a loan of 60,000 rupees from the bank. With the money, she built a home out of dry stick, cow dung and mud. Bringing her old sewing machine inside and slinging up a hand-painted sign on the door ‘Yogita’s Best Sewing”, she started her own independent sewing business. With time, word spread about the quality and speed of her blouses, causing many new orders to come her way. She worked weekends and long hours into the night. In one year she paid off the loan. The next year she had made more money than her father would make in 5 years. With her additional savings she converted her home into a more solid house with bricks and a tin roof to protect from the rain. This was her dream house so she didn’t want to cut any corners. She sourced the bricks and mud, finalized the design and hired workmen from the village to do the labor. She stood over them day and night, supervising the quality of work and making sure her house was going to be the best in the village. Some of her friends had married men who drank a lot and didn’t work. She heard their stories and watched them struggle. If she were to end up married to a drunkard like them, she would have to manage things on her own. Better she should learn how to earn a living and run a home now. She wasn’t going to wait for a man to do it for her. Kenneth followed the directions and came to Yogita’s house. He saw that it was indeed the best and biggest structure in the town. The walls were sturdy, the roof was solid and the windows allowed for great ventilation. She had so much space in the house that she could easily rent out the unused rooms. Kenneth decided to rent half of the house as Sundara’s newest soap recycling workshop. Yogita recycling Sundara soap in her house and our newest Soap Recycling Workshop. In May 2016, Sundara officially opened our soap recycling workshop in Ashte. We were accompanied by Soapbox soap, a photographer and a TV crew. Over 200 people in the village came for traditional dancing, snacks and the ribbon cutting ceremony at Yogita’s house. Yogita is proud to call Sundara her tenant. 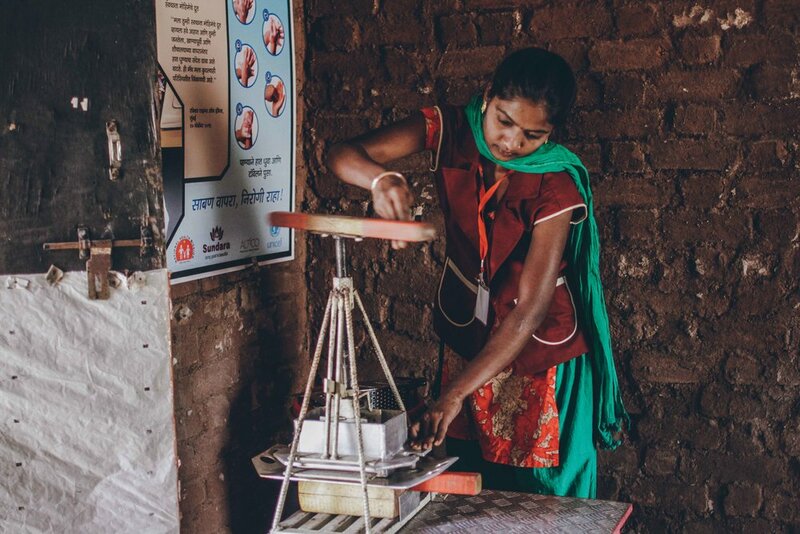 “Every child in my village now gets Sundara soap and hygiene classes because of the work that 3 local women are doing every day in my house. I know that children’s health here will improve and I’m proud to play a small role in it.